Although the cleanse is over, I felt the effects of the Smooth Move Tea this morning. One good thing about the tea is how early it wakes me up. In one way, it’s the best alarm clock I could ask for. FIRST DAY: Several 8 oz. Glasses of fresh orange juice as desired during the day. Drink it slowly. 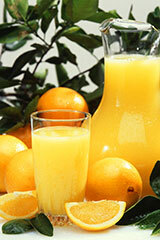 Fresh orange juice is not what you find in a paper carton, it’s what you find in oranges. Because the details here are so sparse, I felt the need to create a little recipe. After improvising that recipe, I had created a very delicious Orange Purée. Highly Recommended. My process of coming off the cleanse continues in the next article. I like the idea of using Orange puree. Natural is always best. Did you notice an improvement in your energy levels from this cleanse Andrew?